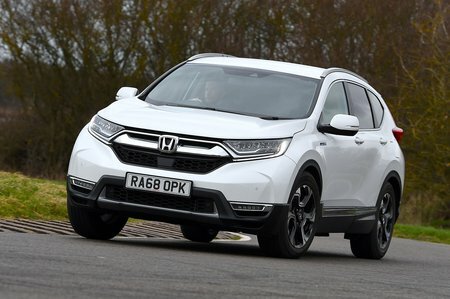 Honda CR-V 1.5 VTEC Turbo SR 5dr CVT 2019 Review | What Car? Starts to push the price up too much for our full vote, but does add things worth having, such as heated seats, leather seats, privacy glass, passenger seat lumbar and height adjustment, keyless entry and more safety kit, including blind spot monitoring. Hooked up to the CVT automatic gearbox the 1.5-litre produces 190bhp and all auto 'box versions come with four-wheel drive as standard. It’ll get the big CR-V from 0-62mph in 10.0sec and it’s peppy enough for most scenarios, without feeling quick. The CVT gets more power and torque than the manual version, and although it's slightly slower on paper we prefer its smoother power delivery. For towing or regularly carrying lots of people, rival diesels may prove a better bet, though, and it managed only 33mpg in our test.